The search for lode and placer gold, how to find gold and where to find the precious metal. 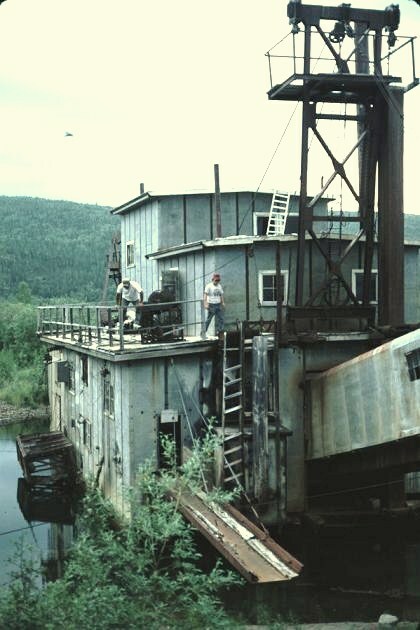 The Duncan mine and mill as they appeared in 1977 (photo by Dan Hausel). Prospectors need to focus on finding ore shoots in veins. Nearly all veins in gold districts will have some gold and silver, but the values are alway erradic. Thus if you were able to follow a vein for some distance you will likely find trace amounts of gold at most locations. When I mapped the South Pass greenstone belt and its more than 16-miles of gold-bearing shear zones and veins, it was quite noticable that the vein-shear zone structures had trace gold with periodic zones of highly enriched gold. In some cases, the gold was enriched as much as 100 to 1000 times that of the normal values in the shear-vein structures. So, why did these ore shoots occur and how was someone going to be able to identify them without crawling across the 16+ miles of vein-shear structures and assaying every inch? Unfortunately, its not so easy. And then there are large areas that are hidden under soil and aluvium that could easily have cover a very good ore shoot. An example of a potential structual-controlled ore shoot. Note the fold in the rock. 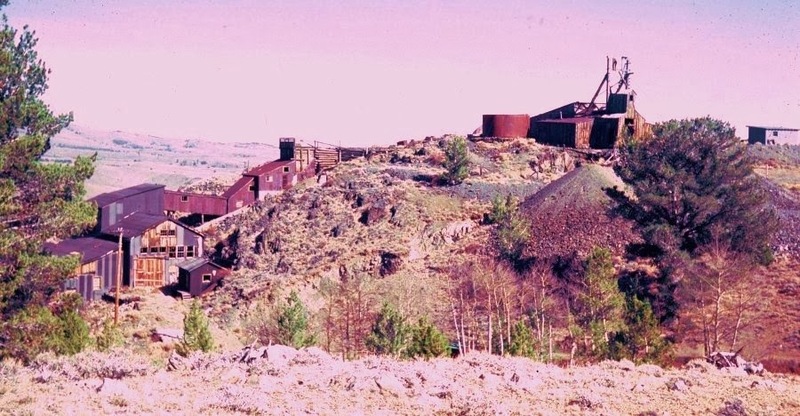 The folded structure in the lower photo is identified as 'folded ore shoot'. The 'nose of folds (ore shoot)' may be enriched in gold, as I found at the Duncan and Carissa mines at South Pass. While mapping around the Duncan and Carissa gold mines, I found some ore shoots where the gold values increased dramatically. But what was causing this was not quite clear at first. These ore shoots were difficult to recognized because of considerable soil cover and also the rocks that hosted the ore shoots were all black amphibolites and it was very difficult to see entire structures. But at the Duncan mine, I was able to collect enough samples across the structure and was able to actually plot the gold value increases leading into an ore shoot. The values increased about 100 times the normal gold values. It turns out that the high gold values I detected (a 2-foot long channels sample that assayed 1.06 opt Au) were part of an ore shoot that was structurally controlled by folding. While mapping the Carissa mine, I found this structure as also intensely folded. Gold values at the Carissa were enriched more than a hundred times the average of the shear structures in the district. Next, let's look at this in three dimensions. Well we can't really, because all we can see is the surface exposure. But at the Carissa mine, the mine shaft was sunk to 450 feet and drilling intersected the ore shoot to depths as great as 970 feet giving us a 3-D perspective. Now imagine these folds are large round pipes (in case of the Carisaa mine, we are talking about a 1,000-foot diameter pipe!). Now imagine placing this pipe in the ground from the surface down into the earth so that it stands nearly vertically. This should give you a general idea of what these ore shoots look like. 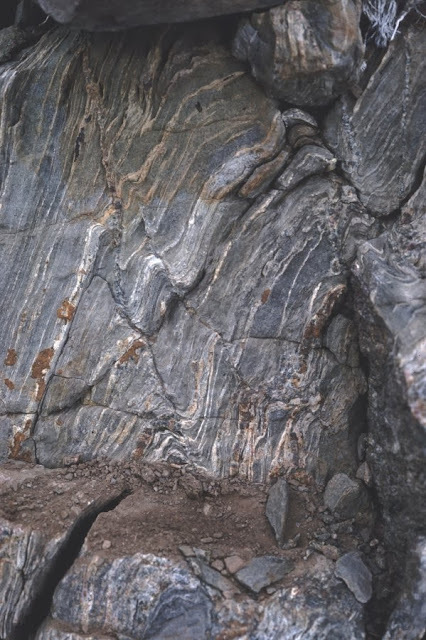 Other ore shoots may form where there is considerable breccia, or an increase in open space by faulting or by a rising gaseous vent. So, breccias should be examined for enriched amounts of ore. There are many rich breccias that have been found in Arizona that are the result of high-pressure mineralized gases erupting from depth. Many such breccias have been found about giganic porphyry copper deposits. Ore shoots are areas in veins where valuable mineralization increases, often dramatically. It has always been a subject of economic geology to try to understand where these rich shoots form and why, so miners can predict where the greatest amount of ore will be found in a vein, fault or shear zone. Ore shoots can form chemically. During vein formation, hot quartz-rich, acidic fluids will react with rocks of favorable chemistry, particularly rocks with calcium carbonate (limestone). Thus following a vein in any area that may have limestone should lead any prospector to search the limestones for gold and other valuable minerals. Replacement deposits and skarns are often formed when such mineralizing fluids come in contact with limestone or even rocks such as limy shales, or limy sandstones. In some cases, the replacement deposits can be very rich. Copper (green) breccia with common quartz prisms in vugs surrounding angular rock fragments. Gold & silver rich quartz vein on the surface. This resistant rock outcrop of quartz can be traced from the camera and continues to the center of the photograph. Most veins are quite linear and can be traced on the surface for hundreds of feet and sometimes thousands of feet.